Ultimate Androgynous Superstar B. Scott was invited by BET to Co-Host the BET Awards Red Carpet Pre-Show with Bow Wow, Angela Simmons, Adrienne Bailon, and Tony Rock. 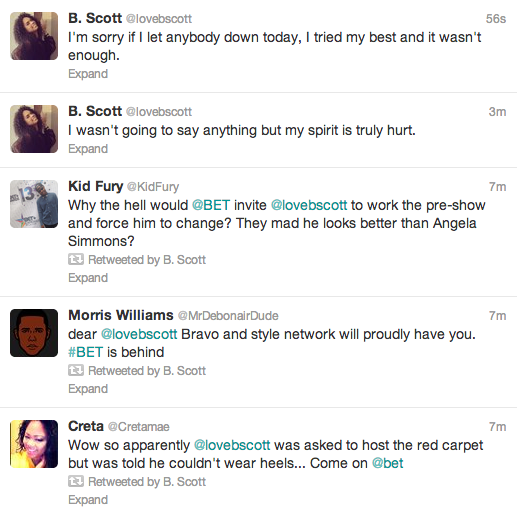 What had everyone confused was why B. Scott late? Well we have heard through the grape vine that Scott was late due to his outfit choice. BET confronted Scott and told him at the last minute he was not permitted to wear heels to host the Red Carpet and infuriated fans have taken to social media to demand an apology on behalf of the gender-bending internet celebrity. Upon Scotts arrival he stated that he had a very trying day butdid not disclose what the actual issue was.